Another example of hunters paying the way for our nations conservation programs. 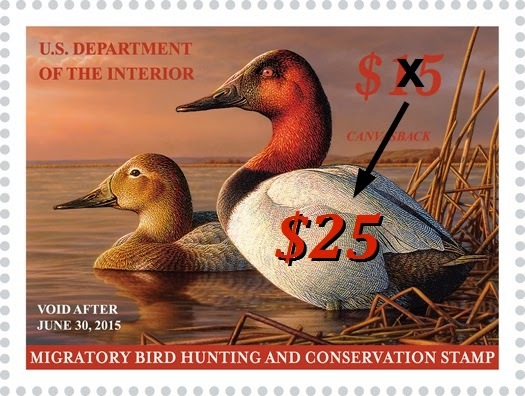 The Senate yesterday, approved a $10 price hike for the federal duck stamp. The House had approved it just two weeks prior. The speed at which this bill moved through the House and Senate was an obvious indication that the long overdue increase was well supported on both sides of the political isles. Conservation and the importance of preserving wildlife habitat are things so fundamentally important to all, that they go beyond politics and receive bipartisan support. In fact you may be surprised to know that the lead sponsor of the bill was tea party Louisiana Republican U.S. Rep. John Fleming, who ranks as one of the most solidly conservative Republicans in the House of Representatives. Proof that even the most conservative among us are wise enough to know that supporting the environment and habitat conservation is just plain good business. It's good for tourism. It's good for sportsmen. It's good for the habitat. It's good for wildlife. The duck stamp bill now heads to President Obama’s desk for his signature before becoming law. Since the debut of the duck stamp program in 1934, it has generated more than $900 million for the protection of more than 6 million acres. The competition to design the stamps is spirited, and the stamps are collectors’ items.